3.7 out of 5 based on 53 bloggers and 15 commenters. 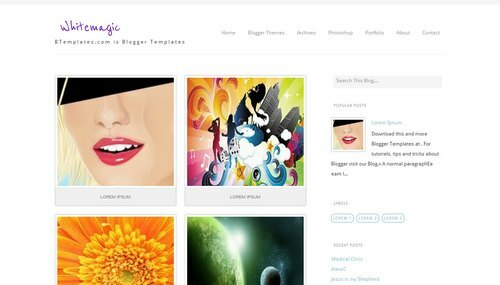 Whitemagic is a free blogger template with 3 columns, right sidebar, gallery-styled, rounded corners, an exclusive design for Blogger, footer columns and posts thumbnails. That’s quite a good template, but it has some errors I think. I keep clicking on download and it keeps sending me back to the main menu. What’s going on? @Rae: The download button works fine for me (I’ve already checked it). Nevertheless, if if doesn’t work for you, please try in a different browser. The template was great until I realized that some of the text from my previous posts were stacked on top of one another making the post unreadable. What a shame. This template was my favorite. – Maybe that’s what’s meant by “has some errors I think”? how can i remove older posts & new posts link in this template.. ?? I really like this template and I’m using it to set up a blog but I’m having a few image problems. When I put images in the post they appear as they are supposed to on the post page (which is great, very easy to post and looks great there) however when the post is referenced on the main page the image is squashed into the cube. How can I get the image to stay in it’s correct form (whether its square or landscape or portrait rectangle) on the post page a take a square highlight from the image for the home page without distorting proportions. I guess this is a bit like twitter- the picture icon is square and not distorted, even if the image uploaded is not. If this isn’t possible, does anyone know a blog template, like this one, that can do this? i love it and im using it but the menu doesnt show up:( but still im going to use this! Hi – I’m having the same problem, Did you find an answer to this? Hello I really like this template, only one question as I can resize the image of each publication, which is square rather than rectangular is as if it were a DVD. The Menu isn’t appearing for me. I love this template – it does almost everything I want it to do. The facebook/twitter buttons are invisible at the bottom of each image – some tweek needed there I think. Other than not having worked out how to increase the menu text – i’m finding it really great! Hi, I’m having the same problem as some of the above users. I really like this template, but the pictures on the post are squashed. How do I get the full image to show on the home page?